Bring a fair weather cloud indoors with this neon-like LED wall sculpture. From fair weather billows to glowering thunderheads, clouds are fleeting phenomena. 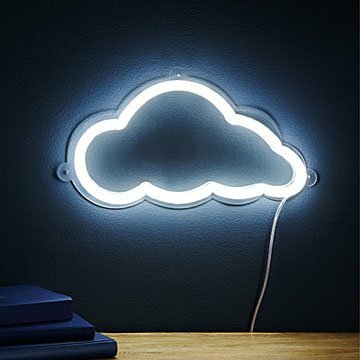 But this illuminated wall sculpture lets you keep a cumulus companion as a playful part of your decor. Made from flexible LED tubing, it has the classic look of neon in a design that's lighter and more energy-efficient. The acrylic backing makes it easy to hang while a low voltage DC adapter provides power to this luminous silhouette. Hang it in an office or studio as a reminder to brainstorm, or in a child's room for a puff of fun. Made in China.